We just had our second meeting on Saturday…1 person came. It was pretty disappointing. We had 7 ladies at the first meeting who all seemed very enthusiastic about getting together to sew – and quilt a few new people sign up on the website, so I’m not really sure what happened. I’ve never organized a group before so I am unsure what I am really doing wrong or if this is to be expected. I don’t know what I need to do to keep people interested and active in the group. I am not an entertainer. I cannot sustain interest in this group on my own. When I started this thing, I figured having the forum would be enough to maintain some sort of connection between the group members and a running dialog going with an active message board…I mean, from what I’ve seen in other cities’ guilds that is what is happening. It’s been frustrating. I found an awesome space in downtown Indianapolis to hold our meetings at the Harrison Center for the Arts – the Harrison Center was very exciting about having us as a group. They are interested in displaying our work in one of their galleries for a First Friday. I was super pumped about this! But at this point I don’t know if we can keep meeting there. It’s 25/hr to rent the space and I can’t keep paying out of pocket hoping people will show up. I didn’t force dues on anyone since it was a new group – I agreed on a pay as you go type of membership so if you come to the meeting, you pay 5 dollars, and your first meeting is free. So our second meeting – one person showed up besides me! We had a good time talking and sewing together, but its a waste to reserve that space every month when no one shows up. So for April, I am not sure what I am going to do for the next meeting. I’m not doing the Harrison Center. Anyone who runs a group or knows how to get this project back on track please share your ideas with me. I want this group to succeed! I don’t know if you are familiar with Leslie Hall and her magical gem sweaters, but she’s awesome. This song definitely helps crafter’s block! Enjoy! All the fabric I ordered finally came in that I ordered from fabric.com and equilter (neither of which sent me the aformentioned wonky fat quarters). 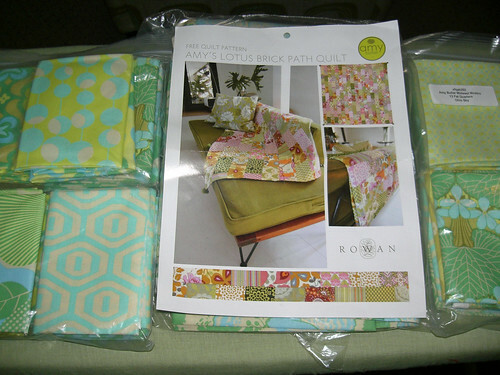 After new years, they both had really good sales on their designer fabric, so I kindof went crazy. 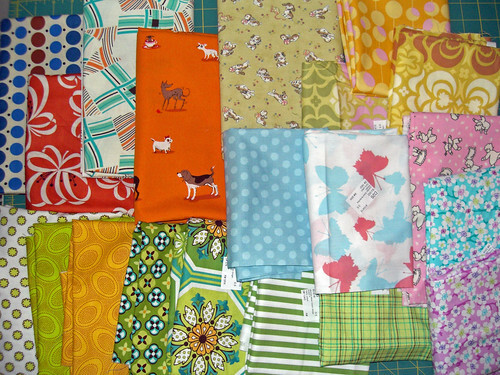 I got some Michael Miller, Denyse Schmidt Katie Jump Rope – yay!, Kaffe Fassett, Amy Butler, Heather Ross and some other random things. I haven’t yet really accumulated a stash, so this was my beginning. I have random fabrics left over from projects, but I wanted to have more of a variety so I can do things more on the fly, giving me more options and room to experiment. 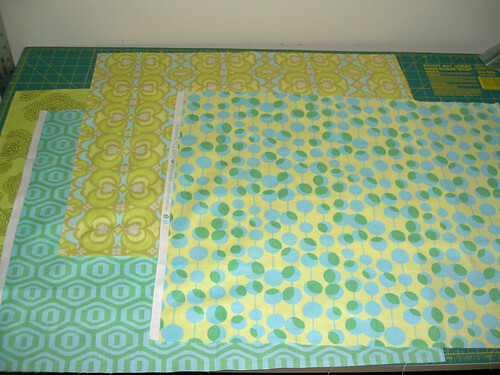 Until now, I have worked by deciding a project, picking out the fabric specifically for the project, then making it. But I think I like having the freedom of having options right there when the mood strikes me to start something. 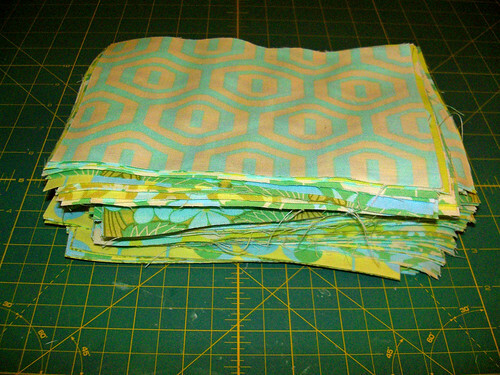 I got quite a lot of “cute” fabrics because I will start making some baby quilts soon. 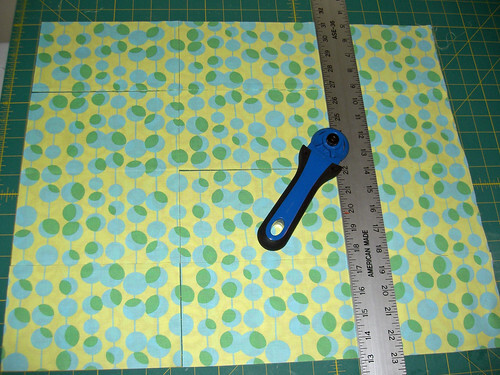 I’ve been drafting some patterns for some baby quilts I am really excited about and I think will be a good start to my etsy store. I have so much to do before I can open it, but at least things are moving forward. I’ve been reading the book Craft, Inc and it has been really inspirational as far as giving a lot of insight and direction on how to organize a hobby business. So right now I’m in the process of picking out and having made fabric labels, creating a logo and banners with help from my amazingly talented friend Christine, making business cards, tags…and I’m sure there is something I am forgetting. I guess I am just a perfectionist at heart, and I have been considering opening this shop for a while. So I am committing to doing it “right” – whatever my definition of that is. And I want to have all of that ready and done before I open the store, because for me that is the best way to do it.